Cooper Crest has the perfect setting for a wonderful home. Located west of the Budd Inlet, the Community is surrounded by nature and boasts impressive views including the Black lake hills. We are close to downtown and minutes from the "Mall". The neighborhood is peaceful and friendly and has 140 lots that are home to people from all walks of life. The Community is ideally situated and is minutes away from the things you need for your home, from grocery stores to restaurants, schools and recreational facilities. The community also has some of the best schools in the district and a hospital that's just a 5 minute drive away! Thank you for paying your dues this year. A copy of the dues notice for 2019 can be downloaded here. The policy on collection of unpaid dues for 2018 can be downloaded here. You can now have your financial institution directly with a completed ACH debit form downloadable here. A handout reminding homeowners about yard maintenance can be downloaded here. By now you should have received an introductory letter from VIS GROUP, INC. David Olsen is the new community manager for the Cooper Crest Homeowners' Association. One of their services is a secure website at www.vismanagement.com. You can use that website to make payments and change account information. Login and password information is contained in the introductory letter from Susan. A contact information form is available here. It can help us communicate with you more efficiently. Page 2 of the form is here and covers renter's info. Have background and interest in managing our irrigation system? We could use your help! Interested in doing occasional outside work around the neighborhood like clean-up and weeding and brush removal, let us know on the contact us page. We may contact you when projects come up.﻿ Pays $15 per hour. Teens must have a hold harmless waiver from parents. 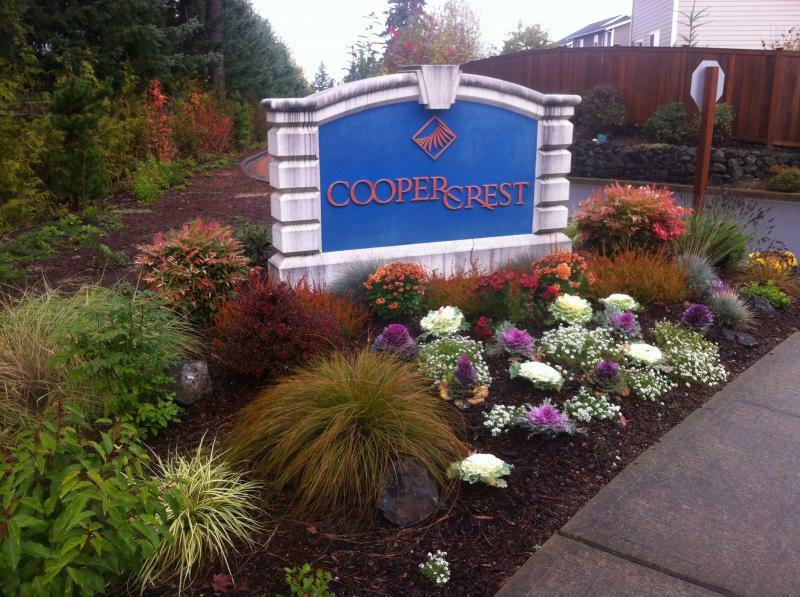 Cooper Crest is located in the west Olympia a serene location with a resort like feel to the wonderful kid friendly community. Note: The elementary & middle school are a few minutes walk from our community.